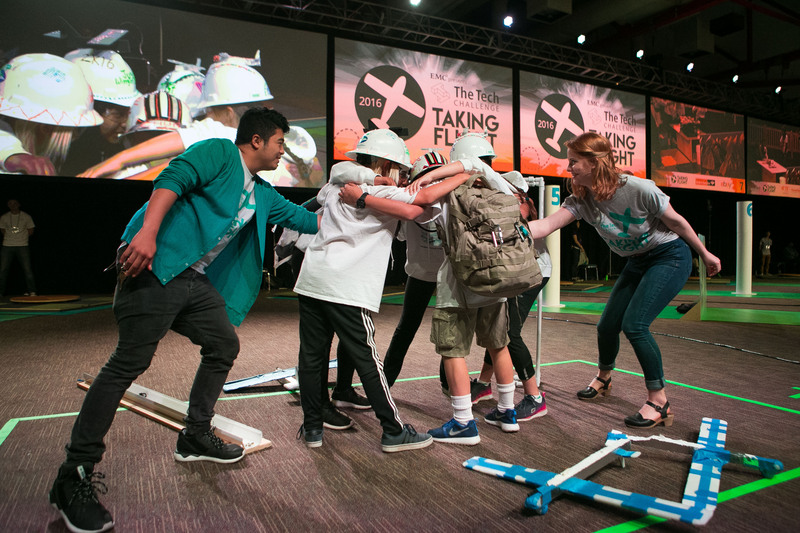 The Tech Challenge showcase is the program's big finale, a weekend during which teams are interviewed by judges, demonstrate their devices on a test rig, and present their engineering journal. It is a thrilling event enjoyed by participants, advisers, family and friends! Print your 2019 completion certificate! Grades 4-5: 9 a.m. to 12:30 p.m., arrive no later than 12 p.m. Awards: 1 to 1:30 p.m.
Grade 6: 2 to 4:30 p.m., arrive no later than 4 p.m. Awards: 5 to 5:30 p.m.
Grades 9-12: 10 a.m. to 12 p.m., arrive no later than 11:30 a.m. Awards: 12:30 to 1 p.m.
Grades 7-8: 1:30 to 4:30 p.m., arrive no later than 3:30 p.m. Please do not arrive more than 60 minutes before your division’s testing time. Your team only needs to be present for its division. Judging is first come, first served, and all teams that arrive by the designated time will be judged. Check in your team and pick up name tags, T-shirt vouchers and queuing pagers. T-shirts are available for team members and one adviser only. Vouchers will be provided at check-in, and you must present your voucher in the T-shirt area to receive your shirt. Teams will be given a queuing pager and directed to the pit area. One adult adviser is allowed to enter the pit area with the team. This space is designated for teams to relax while waiting to be paged for judging. Teams will have access to an 8-foot table to prepare for judging and to ensure their devices have all the finishing touches. The judges will page the team to the judging entrance when it’s your team’s turn. Only team members are allowed in the judging area; parents and advisers will need to walk to the spectator entrance. Teams may choose any available table. Team members should pick up T-shirts before entering the judging area. No running in the pit. Advisers are responsible for supervision in the pit area. One adult adviser is allowed to enter the pit area with the team. Once a team enters judging, it is not allowed to return to the pit area. Please do not leave anything on the tables. Teams will stop by three judging stations. At each station the team will meet with two judges. If a team’s device is only partially complete, team members are still encouraged to participate. Advisers do not accompany the team to the judging area. Each team member will receive a completion medal. Also, teams can take a group photo with their devices. Each participant will receive a copy! Teams will exit the judging area into the paseo behind Parkside Hall, where parents and advisers can greet their teams. Participants may store their devices in their cars or buses and visit The Tech for free, or have lunch while they wait for the awards ceremony. We encourage everyone to stay for the awards ceremony, where multiple awards are given (that aren’t just about how well your device performed!) Teams, advisers, parents, teachers, spectators and the public are welcome to the ceremony, which takes place after each competition. There is no charge to attend. Grades 4-5: 1 to 1:30 p.m.
Grade 6: 5 to 5:30 p.m.
Grades 9-12: 12:30 to 1 p.m.
Grades 7-8: 5 to 5:30 p.m.